Whoops! Maybe you were looking for a different Holmes? Borrowed the phonograph from Edison. Owes Holmes a favour, like any other important person of the times. Holmes, take a look at this. This is some sort of encyclopædia! No, Watson, this is an Uncyclopædia. But how would you know this, Holmes? Note, first, the logo on the top-left. This is not a sphere; it is a potato. This, as I know from my experience, is the logo of the Uncyclopædia. Also examine the serif-less typeface, and we all know any respectable encyclopædias are always set in a serif font. Elementary, Watson. Now let us take a look at this article. Holmes, you are the subject of this entry! Well-deduced. Oh my ... what a wretched hive of unbound nonsense. Look at the picture on the right. What is that? The Great Detective, after being frozen in carbonite. It appears to have dubbed a statue of me as "frozen in carbonite." Holmes, we need to rewrite this article. And what would you mean by "we," Watson? You are the better writer, after all, Watson. And I have to go solve the case of the missing memes, for which I have been called to this website. Oh, and Watson, do try to keep an encyclopædic tone. Do try to stop playing your violin at three in the morning! Sherlock Holmes was a world-renowned private detective of the late nineteenth and early twentieth centuries. His amazing skills for deductive reasoning and observation made him one of the foremost consulting investigators of all time. His companion, Dr. John H. Watson, with whom he shared a flat at 221B Baker Street, chronicled many of his cases under the identity of Sir Arthur "Detective Conan" Doyle. At present, he is retired with no plans of returning to full-time crime investigation. In fact, I am inclined to believe that Holmes was singularly responsible for the sharp decline in popularity of classical music. Mr. Holmes was born in 1854, to a family whose ancestors were all country squires. Holmes, however, would have a different future ahead of him than cleaning up the mess made by allegedly gallant knights. At the age of 8, he was a child prodigy, showing great talent at the violin. This talent would, unfortunately, decline over time such that by the time I started to cohabit with him, his rendition of Paganini's Caprice No. 24 became unbearable. His second elder brother, Mycroft, became jealous and lost all motivation to do anything useful. Because of this, he would later join the British civil service. Holmes went to Sidney Sussex College, where he developed an interest in chemistry. Subsequently, he would blow up the entire school before deducing that the person who had done it was himself. It was here that, according to Holmes, the Lucasian Professor of Mathematics, Professor James Moriarty, became his sworn nemesis after being beaten in a game of chess in only three turns. After graduating, he wished to put his knowledge of chemistry to good use, and attempted to join Scotland Yard, only to be rejected after making some embarrassing deductions about the supervising officer. Vengeful and wishing to exert more power over Scotland Yard than could possibly be imagined, Holmes decided to set up a private consulting detective firm, one of the first of its kind. It was at this point that I met Holmes, and together we tackled the case that Holmes wanted to call A Study in Scarlet. After this, we tackled other cases, such as the one called The Sign of Four. After this case followed a myriad of cases between 1888 and 1904, at which point Holmes retired to the Sussex Downs. From my examination of the books he had borrowed, which dealt with subjects such as insect hives and stings, I had deduced that Holmes was planning to pursue waspkeeping as a hobby; however, I was thankfully quite in the wrong there. Holmes disappeared from the world, presumed dead by everyone in a struggle between him and Professor Moriarty, his sworn nemesis. Fans have dubbed this period between 1891 and 1894 the "Great Hiatus". However, as it turns out, my account of the story was entirely fabricated. Ah, Holmes, you're back. Have you solved the case? It would appear so, Watson. A group of administrators and other advanced users have been carrying out a systematic genocide of Internet-specific memes, in the name of satire. How brutal! How did you figure this out, Holmes? Alas, this is where I feel I become less and less necessary, for all of this I found in the records of communications between users of this Uncyclopedia. We shall always have London, Holmes. I see you have rewritten this article a good deal, Watson. Which reminds me of something, Holmes. Oh, yes, do tell us about the time that you had disappeared. Ah, the "Great Hiatus," as my followers have dubbed it. Well, Watson, I must say that your false account of this hiatus was spectacular. Possibly a bit over-dramatic, although I do wish I were able to look into coal-tar derivatives. No, I never went to such a place as Reichenbach Falls, as was outlined in "The Final Problem," wherein I wrestled with Moriarty and fell off a rather inconveniently high precipice. None of this ever happened on this Earth. In fact, I was nowhere on Earth. You had fallen down a rabbit hole, you say? I also deduced, Watson, that this poor man was suffering from both mercury poisoning and lead poisoning. 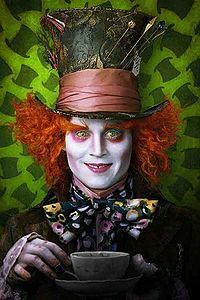 It was no wonder, then, that the man was mad as a hatter. I assure you, Watson, that this was in no way due to my cocaine addiction, and that the fall was entirely intentional. I did solve the case of the stolen tarts, which I see, Watson, you still have not recorded. Just a minute, Holmes. I wish to expound upon my text on the Great Hiatus in this article. Holmes himself has repeatedly claimed that he was trapped in Wonderland, of Alice in Wonderland fame. However, I can affirm the truth that Holmes's cocaine habit—which I have repeatedly discouraged—led to the Great Hiatus. 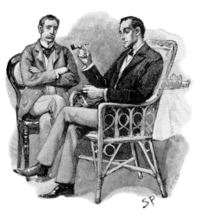 It all began when Holmes and I were sitting in our offices in Baker Street. Holmes was thinking very hard that day on a certain case involving a golden phonograph—a case that I shall one day outline—when he reached for his pipe. Unfortunately, that day his absent-mindedness led to his reaching for his cocaine bottle instead. Evidently he took too much of the vice, for soon enough, Holmes collapsed on the floor. For an instant, I thought the great man was dead. I rushed to his side, attempting some sort of diagnosis of his condition. I feared for the worst when I rushed him to St. Mary's Hospital, and the doctors there affirmed my fears: Holmes's cocaine overdose had resulted in a coma that could last anywhere between two and twenty years. This was the "Great Hiatus"—a three-year coma resulting from a cocaine overdose. What do you mean to say, Watson? That this experience was all a hallucination in a three-year coma whose cause was a cocaine overdose?! I never said any such thing, Holmes. Very well, then. I shall now return briefly to the cocaine bottle, for this was more or less acceptable during the late Victorian period. Be careful to only briefly return to it, Holmes. Now, Holmes, let us talk about your methods. Holmes, your trademark skill is that of astute observation coupled with deductive reasoning. In fact, as I recall, I had recently applied to the Intellectual Property Office for a trademark for you on Holmesian deduction®. If it worked, there should be little ® marks after the word Holmesian deduction®. Watson, what have I told you about commercialising our work? Anyway, tell us about Holmesian deduction®. Yes, it was during the 19th century, despite the looming threats of the Crimean War, the Industrial Revolution and explosive dysentery, that I perfected the analytic technique of assessing available evidence, evaluating likelihoods and the construction of a framework within which the most probable outcome emerges. With Holmesian deduction®, I am able to deduce from Holmes's downward gaze and shape of his left hand that he is text-messaging on an imaginary BlackBerry. Wrong, Watson. For example, Watson, I can deduce that you have been in Afghanistan merely by the air of your appearance, with your medical background, military mood, tint of your skin, and the injury of your left arm. I require no unjustified hypothesis to deduce this. Elementary. 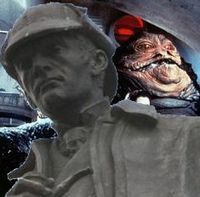 Now, Watson, let us see if you cannot use Holmesian deduction® to infer details about the reader? Err... Oh, yes. The reader is <insert name here>. Watson, you fail to reason from what you see! Think about the potential of this single piece of information! Ah, yes, but of course. I can then deduce that the user page of this user is located at User:<insert name here>, and the user talk page is located at User talk:<insert name here>. But Holmes, could it not be that perhaps you are overusing Holmesian deduction®? Ah, Watson, surely you know that the reason I deduce personal details about everyone I meet is that I suffer from obsessive-compulsive deduction syndrome—a gift, and a curse. But what, Holmes, if modern criminals study your cases and determine exactly how they are likely to be caught, thus using Holmesian deduction® to ironically form the basis of their plans? Watson, there will always be ... other ... methods available. 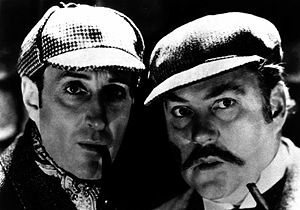 Holmesian deduction® is one of Holmes's trademark skills, and a method that has endured the past century and utilised in real-life police. Assessing available evidence within a carefully designed framework, Holmes is able to deduce the most probable outcome without making unjustified assumptions. One such example is Holmes deducing the fact that I had been in Afghanistan, near the beginning of A Study in Scarlet, purely from concrete evidence and deductions from that evidence. Should Holmesian deduction® fail, however, Holmes appears to have enhanced interrogation techniques in store. There, that should be enough on your deductive reasoning techniques. Now, Holmes—What? Holmes, where are you? Sherlock Holmes?! You know about Sherlock Holmes?! The Doctor. Time Lord, Gallifrey, 916 years old. Never heard of him? Holmes, your disguises are normally better than this one. Watson, I see your observation skills have improved. What gave it away? Was it the omission of the "h" sound at the beginning of some word? Was it the sheer shortness of the scarf? No, Holmes. It is the mere fact that you chose to disguise yourself in a section about disguise. You're right, Watson. I will have to be more careful in the future. But Holmes, you are indeed a master of disguise. You are absolutely unrecognisable when you are in disguise. For example, you were in an opium den, disguised so convincingly as an opium addict, in both behaviour and appearance. I remember. Was this not in the case of the man with the twisted lip? Yes, Holmes. Just a moment. Holmes is a master of disguises. In the past he has fooled me with his methods, in examples such as A Scandal in Bohemia and The Man with the Twisted Lip. Not only is his physical disguise convincing, but also his acting complements it perfectly. Mostly such disguises are a way of going "under cover" in order to gather evidence for his cases. Say, has it occurred to you that such disguises may cause you to run into any trouble with the police? What could you possibly mean, Watson? Holmes, you were just impersonating Sir Doctor of TARDIS, who, I believe, is now an enemy of the crown, and is known to be able to change his face. Even if you were to reveal yourself, Holmes, you would be suspect. What in that case, Holmes? I presume that, in that sort of case, the only option would be for you to post bail for me. Holmes, you are absolutely right. All we need now is an oversized explosion occurring right behind us. All in good time, Watson. Holmes, were you really once a great fist-fighter? Well, I did box for a short while at Sidney Sussex. You are, however, a great deal better at the martial arts, I presume? Yes, but what use are either of those when we have both whips and revolvers, Watson? Ah. Let me scrap the section on weapons and martial arts I was writing and replace it with a brief note. While Holmes has the use of martial arts and is a reasonable fist-fighter, he prefers to save effort by using his revolver instead. While he also possesses a whip—apparently in an attempt to imitate the American Henry Jones of recent adventuring fame—he has yet to master its art fully. Holmes, you are a very knowledgeable man. Of course. All knowledge comes useful to the detective. What about, say, the belief that Earth orbits the Sun? That would be an exception. All exceptions, Watson. Useless things clutter the mind. Except for the fact that you have, as a matter of fact, used knowledge in those last few areas in solving certain cases. Watson, have you noticed how cluttered our flat appears to be? Let us change the subject, Holmes. Let me write some more of this article first, and we shall go into other matters. Holmes's stance on prior knowledge appears to be highly contradictory. In one story, he claims that "useless things clutter the mind", which explains how little he knows about politics, astronomy, philosophy et cetera. However, not only does he use a great deal of those "useless things" later on, but also he notes that "all knowledge comes useful to the detective". Holmes tends to not wish to discuss this inconsistency. Watson, I have to remind you once again that you must keep an encyclopæedic tone. Ah, Holmes, I was forgetting about this. Now, Holmes, we shall deal with Moriarty. Holmes's greatest nemesis is Professor Moriarty, London's very own criminal mastermind. Holmes alleges that Moriarty, formerly a mathematical prodigy, unfortunately turned to crime, and operated a massive criminal operation that Holmes was, at the time of "The Final Problem", on the verge of destroying. Holmes, tell me. Was he really such a nemesis? That is quite trivial, Watson! So how come he has only appeared in two of our cases, Holmes, one of which was entirely fabricated?! Yes, Holmes. He appeared in "The Final Problem", the fictionalised account of your demise; and in The Valley of Fear where, while he did not make a direct appearance, he nevertheless played a direct role. These were, however, the only cases. Here, I shall type that up at this very moment. 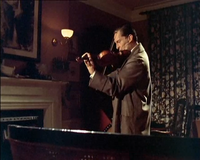 However, with the recent revelation that "The Final Problem" was entirely fabricated, the only role Moriarty played in any of the cases was in The Valley of Fear, where he failed to make an appearance in person. Some accounts suggest that Professor Moriarty was either entirely a figment of Holmes's imagination, or was an actual person to whom Holmes falsely attributed whatever cases he failed to solve. Yes, Holmes, I am suggesting that you developed a split personality disorder while researching the latter case! 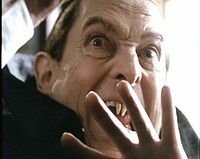 Are you suggesting that Professor Moriarty never existed?! He was the Lucasian Professor of Mathematics at Cambridge University, Watson! A mathematical prodigy! He was the only individual capable of defeating not only me, but data itself! Watson, my cocaine intake is not damaging in any way to my health! —beekeeping business may have aggravated the situation. Before we leave, Holmes, I think we should talk about your legacy. Capital, Watson. If you'll hand me the keyboard. Holmes is simply the best detective in all of history; a man of such wit and skill is likely to be celebrated through the 24th century and beyond. Museums and societies have already doubtless begun operations to commemorate his infinite wisdom. His great methods of Holmesian deduction®, his disguises, his skill with the revolver, his titanic extent of knowledge, and the eternal struggle with his arch-nemesis Moriarty will be an integral part of history for the next few millennia. Such a legacy will do, Watson, would it not? You do realise your utter arrogance in saying that? What, Watson? You believe those impostors at Scotland Yard are at all at my level? —and instead I may have discovered, isolated and determined all chemical properties of the noble gases, and would have been an honoured member of the Royal Society. Holmes, you know what terrifies me about that? That I am always right. Since when have we been on a first-name basis, Sherlock? Good point, John. Holmes, I'd be obliged if you would return my keyboard to me. I shall now write on references to you in popular culture. Dr Gregory House, the main character of the FOX TV show House MD, is said to have some basis upon Holmes's character, and similarities are often evident between the two. The absolute impostor! The impostor! Now, Holmes, please calm down for a moment. You know how much I hate to spill blood over such trifling matters. I think we had better leave for Dr. Freud before you hurt yourself, Holmes. Let us return to our stagecoach. Impostors, I tell you, <insert name here>! Impostors! Come off it, Holmes, please. For those without comedic tastes, the self-proclaimed experts at Wikipedia think they have an article about Sherlock Holmes. ↑ This future was left to the eldest brother, Sherrinford, who would come to strongly resent his younger brothers. ↑ According to some speculators, he is the British civil service. This would explain the extent of efficiency of the British civil service. ↑ All of these deductions are left as an exercise for the reader's imagination. ↑ Believe it or not, apparently this is an actual theory put forward by a man named Mark Bourne, who wrote "The Case of the Detective's Smile." We salute you, Mr. Bourne. We salute you indeed. ↑ After this point, I resolved to omit any mention of Holmes's cocaine addiction from my interview, for he would compulsively reach for that very drug when I mentioned it. As a famous songstress once noted, "isn't it ironic?" ↑ At this point, I paused and reflected on how utterly arrogant Holmes was in evaluating his life. ↑ At this point, I gave up. There — the article is finished!